The National Reverse Mortgage Lenders Association is making new guides available for real estate agents and homebuilders that will help those professionals introduce reverse mortgages to their older clients. The initiative rolled out last week to include two toolkits — one geared toward Realtors and the other specifically for homebuilders. Both detail the Home Equity Conversion Mortgage (HECM) for Purchase product and are available on NRMLA’s website. “HECM for Purchase offers greater flexibility to retirees and near-retirees as they prepare for the next stage of their lives. 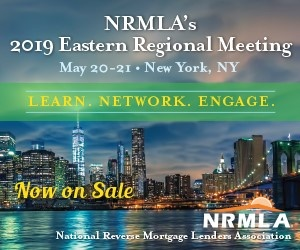 But because the product is still relatively new, many older buyers are not aware that there is an alternative to paying all-cash for a new home or securing financing with a traditional mortgage,” NRMLA president and CEO Peter Bell said in a press release. Industry members have had some measured success in educating both homebuilders and real estate professionals about the merits of the HECM for Purchase product, yet many believe there is potential, with the right education, for it to become much more widespread among senior borrowers. The guides are designed to provide a product overview, discuss borrower profiles, define key terms and tips, and direct readers to additional resources. NRMLA members can also access customizable versions of the toolkits. “NRMLA’s new toolkits will help real estate agents and homebuilders recognize scenarios when a HECM for Purchase might meet their clients’ needs,” Bell said.